The Parrot AR Drone 2.0 is the most expensive remote control toy money can buy; it’s a smartphone controlled quadrocopter with a 720p HD camera, and it’s ridiculously fun, but quite temperamental. It’s an enthusiast level device with an affordable $300 price tag. There simply is no competition at a comparable price. It’s far from perfect, but it’s certainly fun! The device is remote controlled, but you will need a smartphone or tablet running either iOS or Android – there is no standalone remote supplied. 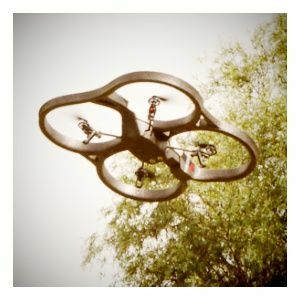 What follows is a review of the Parrot AR Drone 2.0 untainted. We purchased the review unit ourselves and will be giving it away to the MakeUseOf community. Read on to find out more about this $300 toy and how to be in the running to win it! Initial impressions taking it out of the box: it’s a delicate product, and featherlight. I was quite shocked by the size of it actually – it was certainly larger than I imagined. Tiny motors drive the four blades; there’s exposed circuitry under each one, with a small LED to indicate status. Snapping in the UK plug, I set it to charge while reading the quick start guide. The first thing you’ll need to do is download the controller application – FreeFlight 2.0 – to your iOS or Android device. The drone is incredibly lightweight, with the inevitable consequence of being nigh-impossible difficult to fly in the wind. Construction of the main unit is polystyrene and tough plastic – solid enough to protect the onboard computer – but the fact that replacement circuit boards, and motors are readily available imply it can break easily. I didn’t break this one yet though, you’ll be glad to hear. Two hulls are supplied – the indoor one offers complete protection for the blades, and is made entirely of polystyrene to absorb the shock of crashing. The outdoor hull offers zero protection for the blades, and just serves to cover the battery pack. Both are hooked over the front of drone and secured via magnet in the back. Removing and replacing it is easy, as you need to do it everytime in order to charge the battery. In all the photo’s here you’ll see the indoor hull being used. Underneath the device you can see ultrasonic sensors and an additional camera – these aid with detecting the ground level, but you can record or view that video feed too if you wish (it’s not HD). On the front of the drone, pointing forwards is the main 720p HD camera – which is surprisingly great quality. When the wind completely dropped, the drone was a joy to fly, and after a little practice, I soon got the hang of cornering properly. It’s just a shame that every minute or so, despite the best efforts of onboard stabilization algorithms, a slight gust would either send it crashing to the ground or just refuse to go the direction I told it; sometimes it was possible to land safely when this happened, sometimes not. The indoor hull – which I kept on all at all times in order to protect the blades and motors – does get damaged easily. I apologise in advance for some slight chips that occurred during testing. Replacement hulls are available, but at $40 (or even £40, if you’re in the UK) they seem a little expensive. Either way, I wouldn’t dare flying with the outdoor hull. I’m just one guy though; if you want a good idea of how successful others have flown their AR Drones, check out the best of selection from real user videos [No Longer Available]. When inserting the battery, the device creates it’s own ad-hoc WiFi network to which you must connect. You’re then free to launch the FreeFlight software. The main screen of the software is a little deceptive; the Academy hasn’t even been implemented yet, and instead takes you to a sign up form to be notifed when the feature is available. Other buttons offer web integration to user videos or the (also non-existant) games apps, and quick access to your own media. The main part of the app you’ll be concerned with is Piloting, which is where you fly the thing! Takeoff and landing is done by simply tapping the green button in the bottom centre. I suggest you adjust the options before taking off for the first time though. There are two control sticks on the left and right of the screen. The left one controls pitch and roll and is used in conjunction with tilting your smartphone or tablet – so you need to push the stick forward, and tilt your device forward – in order to move in that direction. I found this to be counter-intuitive, but its stick movement only can be enabled with Joypad mode from the options screen. The right stick controls altitude, and yaw (lateral rotation). If you’ve ever tried to control a helicopter in Battlefield, it’s a similar concept, but a lot more forgiving; without your input, the device hovers, so you’re free to take things slowly and explore the controls. Absolute Control is a beginner friendly mode that adjusts the steering to be from your perspective rather than the drone itself. In the default mode, if the drone is facing you, pushing left on the control will move the drone it’s left – your right – so you either need to navigate using the camera feed on-screen, or imagine yourself from the device’s perspective. In Absolute Control mode, pushing back will always bring the drone back to where you are; pushing left will always move it left; regardless of what direction it’s pointing currently. Flip is a new feature for the Ar Drone 2.0 as well; a double tap on the right control stick will make the drone instantly do a mid-air somersault. It’s a crowd pleaser, basically – though I did find that even flipping from a height of about 3m, the drone would drop down to the floor and bump the ground at the end, which you can see in the videos. The flight options are incredibly customizable – there are default settings for indoor and outdoor flights, but you can adjust everything from altitude to tilt angle and rotation speed. With the device is placed flat in front of you, Flat Trim from the options screen resets the on-board sensors, so you should always run this before a flight, especially if you’ve just had a knock. Though the box indicates that additional “games” are available to download, these are not configured to work with the AR Drone 2.0 yet. Expect compatible games to be released over the coming months. Interestingly, the device has a full SDK available, which means enhanced flight controllers are also available; though I haven’t tried this, check out the demo video of Drone Ace 2.0, which adds tons of features. The stated battery time is 12 minutes, which I found was accurate. This is undoubtedly a limiting factor, and could really be a downer if you’ve driven a long way to a special location just to film. It takes 1.5 hours to fully charge, but you can purchase additional battery packs for $40 each to get the most enjoyment, as I suspect most owners do. When the battery falls really low, the emergency cut off will kick in, which is supposed to land itself to avoid damage. In practice I found that with about 10% battery left, the drone would refuse to take off again; running longer flights is the only way to use up the last ebbs of battery power. The WiFi has a 50m range, but interference will occur in built up areas can occur; if you fly out of range, the link will be cut and the auto-pilot will stabilize the drone in place, waiting until you come back into range. This is going to happen a lot at first, but an emergency cut out will occur at the first signs of a motor jam or full on crash; this avoids the motors trying to continue spinning and burning out or damaging themselves. Recovery is usually as simple as placing it flat and taking-off again, but one on occasion it refused to take off again due to “angle error” and a full reset was required – here’s a guide from the AR Drone flyers forum on how to do that. As well as relaying the video feed to your controller, there are two options for recording. First, you can stream video and record directly to your mobile device; this is by far the easiest option – just hit record and you’re sorted. However, the video quality as you can see from the sample flights can be sketchy at times when WiFi signal isn’t ideal. For best recording quality, you can attach a USB stick directly to the drone, just above the battery. This is difficult to get working though, and there’s no way to check if it worked correctly until the recording is completed. The USB stick needs to be formatted as FAT32, shielded with a metal case, and furthermore the case needs to be grounded to the correct pin on; one forum user tried 5 different metal-cased USB sticks, and only one of them worked correctly. You also need to allow time for the on-board embedded computer to save the video file – this takes roughly as long as the video itself. During this time you can continue flying, but just not be recording any longer. Ideally therefore, you want to take your video for the first 5 or 6 minutes, then turn off recording, and continue flying until the battery dies. None of the sticks I tried worked correctly, if you’re going to take professional quality films with the drone, you’ll need to seek a memory stick that’s proven to work. Should you buy the Parrot AR Drone 2.0? Despite having an indoor hull, you’d be hard pressed to find a house big enough to fly this in. A hall or hangar perhaps, but the average family home won’t suffice. I also can’t suggest flying with the outdoor hull at all – with all the blade protection removed, you may quickly find the motor gears are broken. The ideal environment for flying this is a windless desert, but honestly you’re going to have a great time with it and be turning heads anywhere you fly. As long as you avoid windy days, and give yourself plenty of space, you should be fine. Take things slowly and don’t assume the onboard flight assistance is going to mean you never crash. You’re going to have a lot of fun with the AR Drone 2.0; if you can stop worrying about breaking the most expensive toy you’ve ever owned, that is. We’re giving this review unit away to one fortunate MakeUseOf reader! If you enjoy high-flying, join the giveaway to win this Parrot AR Drone 2.0! The giveaway is over. Congratulations, Rob Berry! You would have received an email from jackson@makeuseof.com. If you require any assistance, please get in touch with jackson@makeuseof.com before Aug 20. Enquires beyond this date will not be entertained. Any drone giveaway for 2015? Can't wait for it to arrive!!! Just got done reading a new book called Kill Decision all about unmanned drones and part of it had a huge "army" of these, or something pretty close lol, with guns mounted on them. Crazy scenes and sounded pretty scary but a good book overall...if you are into that thing lol. This will upset the cats that stalk birds in my back yard! It has two cameras built in. Why on earth would you try to LIFT another? this would be perfect especially during night so i could spy if there's snatchers or something. Firstly John, that's very presumptuous of you to assume we won't respond, and I'm quite offended. Second, there is an unsubscribe link in every email, please use that. I don't have access to the email list for security reasons. As for requiring a social network, I'm sorry you don't agree with that requirement. For your information - your GMAIL account would work just fine for authentication. All you need to do is login with that, and you would be eligible. There's nothing "social" as a requirement at all, and you needn't share the article unless you want the extra entries. It simply provides us with an authenticated user, a guaranteed email address, and a one-click entry method for yourself (as well as opening up the gaming possiblities where users that contribute to the site more gain access to a wide variety of free software on our rewards page //www.makeuseof.com/rewards). Also, I've removed your email from your comment for obvious reasons - try to avoid writing your email in plain sight to the public on the internet, John. It can be harvested and used to spam you. It's something that appeals to all boys (and girls, I presume), your very own hovering craft! Still, if they could make it lift heavier loads, like bringing up a screwdriver from the yard and bring it up to the roof where you dropped it, it would be neat! I guess the FAA is going to start enforcing new regulations now that stuff like this is commerically available. I was hoping to try building one in our "Hackspace" at Uni. Very cool and also related to our Human Interface Technology work!! this would be of great use to those who like making videos and documentaries, etc. a very nice way to achieve aerial perspective/ birds eye-view. Would be an awesome Christmas gift for a kid. Why wouldn't you want this? Looks like fun to me! Pets of central Oklahoma, beware! I can see this gathering dust in the workshop! A friend bought one of these and brought it into our open plan office - the perfect place to fly it. Anything light enough to fly for a reasonable time on small batteries will be too light to cope with any significant wind. Always wanted one! Can I have it please, pretty please. I'd love putting a video camera on that and taping my "flying adventures"
It has two videos cameras already, so that would be a bit pointless. Well, more than a toy, it can be used for work, as example, to monitor installations. We work on stage, and if you have rigging, you can check it with this, or the position of a projector or cables in the high of a theatre. Or for a concert, have a eye if in the preparations everything is doing fine. The live streaming on a standard device (like phones) is for this mobile monitoring just perfect. This One is really Awesome. I'd love to fly this over the cabin! This looks like a really cool toy! Probably useless... but lots of fun! way cool. I'd love one of these! This is BS! Just let me enter! This is so cool! I wonder how high you could go, and what battery life is like. Based on the review, mabye it should've been built tougher. I would love to have one, just to have fun! 12 minutes flying time is is quite low. Really these kind of copters always make to my wishlist but AR Drone is on the top of my list ! but how do u compete with 6000 point ppl on here? more point doesn't mean you have more chance. As Denny says, number of points has no relation to chances of winning. It costs 25 points to enter regardless, and then sharing using the buttons gets you additional chances. An invention that leads adults to play like children! Nice review. $300 is not unreasonable for a pre-built quadcopter with 2 cameras included. But for a similar amount of money you can build you own that will outperform the AR drone by a significant amount. I'm in the process of building one for around the same price as the drone, but mine will have a significantly higher lift capacity to allow me to mount just about any camera I want and should be able to handle wind with no problem. Once I add in the cost of cameras and video transmitter, I will end up spending more money, but I will have a much more capable quad. But, replacement parts will be much cheaper, saving me money over time. My motors cost less than $10 each and are rated at almost 15x the power of the little drone motors. My batteries cost 1/4 the amount as the AR drones and they are 3x the capacity. If you don't need or want the video capabilities, and just want something small, cheap and fun to fly check out the Blade MQX or Walkera Ladybird. the videos you can shoot with this toy are amazing! Great invention! Looks cool. Pity the replacement parts cost so much but guess it teaches careful flying. I just entered and shared. I hope I win !! For some reason, clicking the "exchange points" button don't do anything for me. I have enough points to do so. I tried both in Chrome and FireFox to no avail. Do you run any adblock plugins? noscript, ghostery? Nope, and I turned off my Antivirus to check if it interferes with the site, to no effect. Awesome giveaway! I was planning to get one. This reminds me of the Micro Mosquito helicopter that I gave my brother for his birthday. The Mosquito was more frustrating than it was fun at first, but once you got the hang of it, flying the thing was pretty fun. Most people that I know could not afford a $300 toy and you can imagine the horror of crashing and destroying it on your maiden voyage. Thank you for the chance to win a Parrot AR Makeuseof.com and James for writing the article. I really need one of these air drones! I would use the ar drone to go up and down the grain elevator i work at to check on things when they are running. Would love to have one of those Air-Drones !! :P !! Great toy man.. Never had anything like this before! Definitely want to cop one. The wifi range and stability issues seem kinda scary, but I'd definitely love to get my hands on this geeky little gadget! OMG I am going to get one! Way cool !! If I had the $300 to spend on fun stuff, this would be one of the first things I would get. Kind of a bummer about the instability in the wind, as I have seen so many of the various Heli toys out there these days - they are just so lightweight that the slightest puff of wind sends them into a tailspin. A mate of my has got one. It is incredible fun and catches everyone's eye. Must have one! I need to have this, pick my name in the drawing. Is this better than the hexacopter? I've been dying for one of these since they came out. Loved flying my buddies drones & wanna join the AR Elite. By Making this comment it'll give me enough points for a ballot. I can't seem to find the entry form for the giveaway? the entry form should at the end of the article unless you have enough points. You need to create a user account first. Are additional battery packs readily available? Yes. About $50, I think. Thanks a million for this giveaway, I have been reading about it's amazing features and it's reviews are amazing. Use Case: Drop a bomb in the enemy territory! LOL! Could it be use to drop a bomb somewhere??? how many points does it needs to enter the giveaway.?? Loved it from the start! the best part is we can control it with an iOS device!! Am I the only person who does not see the point in these? Are they expensive to repair? Use that account to register. In future, this will be required. Use the buttons in the top right of the sidebar to connect accounts. Now if they only made a single passenger unit! Expensive toy for a week, and it is fragile too. Could really use for a gift! Thanks. do want.. such a win. I have seen these a lot lately and they look like sooooo much fun! Quads are crazy fun and I contemplated building one from scratch, but it probably wouldn't come out nearly as nice as this, wouldn't have iPhone capability and would likely cost as much if not more. Darn interesting alright. But I'm curious as how the quadcopter connects to the phone. I mean, does it use the cellular carrier (which would require an additional sim card on the quadcopter! ), or by Bluetooth (which would limit the range!). Clue me on this, will ya, James? BTW, I'm no aeronautical engineer, but I was wondering if the way wandering beast could be tamed (or stabilized) by adding weights? I tried that once on my nephew's RC chopper when he crashed it one too many times & the flight was all screwy, worked like a charm (until he crashed it again :D ). Just my 2? worth ! The 'copter creates it's own Wifi network, to which you must connect from your mobile device. This allows for much longer range. I doubt weights would help; it would have actually been better if I flew without the indoor hull outside, I just didn't to break it. There are many uses for this... like fun, doing things outside, doing things with friends. I understand how some people see these activity types as useless... To each his own... I would definitely love to have one, especially if it "fell into may lap" as a result of the giveaway! Sorry everyone - somehow site's PHP messed my name? The coolest toy to buy for a 30 year old child! I have a remote 'coptor. It's fun but hard to control. We would have a blast with this ! This is fantastic. I would love one of these. I saw these at CES and they were AWESOME! I would love one of these. My dogs sit and watch us fly the remote helicoptors all the time. I can't think of any use for this, but I still want it! i want one! !Thanks for this giveaway ! Nice gadget to play with your dog, Thanks! Because thats the system we have in place. You are not obliged to participate in game features if you don't want to - it's a way for us to reward our loyal users who really help the site to grow and spread the word, or participate in discussions. My dad would love this, he's into remote control helicopters and such but I'm not gonna waste an entry on this. Still pretty cool, for those that would like it. a fun toy to have! This looks great for my 14 year old grand child so count me in please and thanks. Shared Liked and Tweeted. These look like great fun. Must put one on my wishlist! The wind probably makes it impractical to use anywhere near my location. But it looks like it would be fun to try. This looks so cool! I want one! This looks great fun and I really want one. Having said that it seems the kind of gadget that its worth waiting a bit longer for. The way the market moves you can see in a year or so the same gadget would be cheaper and / or allow a much longer flight time. Or is it destined to always remain a niche toy? I think it'll remain niche, to be honest. Unless some dramatic battery tech happens - which it hasn't for years - the flight time will remain short. Nope. Never. The weight of solar panels required to produce enough juice to fly would make it too heavy to fly in the first place. I do wonder why it wouldn't work with all FAT32 sticks. Maybe the writing speed? A really cool thing , surprised they're giving one for free thou , i won't participate but best luck to all who participate . I've played with a friends and it was pretty cool. strong winds gusts sue cause some issues but still fun to play with. Wow... this looks like a really neat device! I used to fly rc planes but never got to try a helicopter (beyond the cheap toy store kind). Love to give this a try! Thanks for giving an old timer the opportunity for some fun with the giveaway. I'll try for the giveaway, but probably wouldn't buy one at this time. yes it is overpriced but hey gotta be fun so yes i would love to have one !!!! I would spend $300 on this "toy" but I would really enjoy it if I won one. Too bad it doesn't have better battery life but to make it that light, it would need to have a small battery and the rotors probably eat up quite a bit of power. I have one and I love it. It does take practice to fly well (I used and empty gym), but once you get the hang of it there is nothing else like it. There are even hacks out there for using other controllers like a Wii remote and PC joystick. I used to fly remote controlled airplanes, but gave that up when I crashed too many of them. This looks like something that would be a lot of fun to operate without the worry of damaging it. This looks like a fun toy, but honestly, it would last less than a minute if it took a dive and my min pin caught it....which she would. No $300 chew toys at my house LOL! I first saw one of these contraptions at an online auction site and they looked like the latest cool new toy, but they don't seem to be that aerodynamic...yet. In other words, hard to control. RC airplanes, on the other hand, tend to glide back to earth on their own, even after losing control (unless something breaks). This would be a great useful tool to have access to. It'd be so cool if I'd win this! I'm looking for a drone for our local police and fire are rescue squads. Guess I'll have to look for something more high-end. We can't count on sweet breezeless conditions when time is critical. Yeh, this isn't really suitable for actual emergencies situations. You'd need to look at professional gas powered rigs like the $10,000 I linked above. Love it !! i badly want it !! My grandson would have a great time with this. I have full confidence that I would master this! Good luck to all those around me as I do. This would be so cool. I live in a small country town. The neighbors already hate me, but with this...!! Damn, could I cause some havoc!! It would be great, I could get my pictures of those trash dumpers on the end of my street. Whoa, seems pretty awesome, especially the camera, too bad it doesn't have any microphones to record sound though, and the somersault, lol. It would be really nice to win one. How many points are required to enter the draw? this looks cool... I'd like to win it! I know I can't enter on this one, but I would love to have the Parrot AR Drone. I've been looking at it for a while now. I'm pretty much surrounded by trees here, so I think it would work for me. Still thinking though! Thanks for the info! There's an Android version of the software? I want to give it to another geeky friend of mine who is a remote control aficionado. could waste so much time if I had one of these! Very cool, thanks for the giveaway. really want to try this one. Very detailed review. I had the chance to try this out once and it was was fun. Too bad the price never seems to go down at all. I will just stick with toy helicopters and kites for the time being. Count me in, my kids will love this. No, as I said in the opening paragraph: "The device is remote controlled, but you will need a smartphone or tablet running either iOS or Android – there is no standalone remote supplied." My nephew love this device a lot, winning this device through giveaways will make him happier i think. A great toy to play with. I would love to have one of these so i can bring it to the mall and initiate a full out assault on the helicopter kiosk and their toy helicopters that always make me feel like a bad parent for always telling my son no when we walk by...."Why can't we buy one you ask son? Because we don't tolerate weakness. helicopters are weak, we embrace power, with our new quadrocopter." Try not to get arrested though, eh? The Parrot AR Drone looks super fun! I would have a great time using one of these. This is awesome, but it is pretty expensive. I love quad rotors, but they take a lot of effort to build with all the soldering and programming. Are the camera and motors being powered by the same battery? aLWAYS WANTED ONE OF THESE!!!!!! Since you have never tried flying the Parrot with its outdoor hull, may I suggest it could help with the wind? The first thought that came to mind when reading the part where you mentioned it had trouble in wind was the indoor hull was catching the wind. Without the indoor hull, the wind would not have as big a surface to push on. It could improve flight capabilities with the hull off. On another note, $300 is expensive for recreational aircraft. With $300, one could buy a gas powered Apache model. Thanks for not destroying it and offering it as a giveaway. This was an awesome review! Would love this as a substitute for ballooning or hang-gliding i'm too chicken to try myself! This looks like an extrodinary toy/tool for anyone from 6 to 60 with dreams of flight exploration. Count me in. OMG - yes please. I've wanted to play with a quadcopter for ages, but since I've gone back to Uni my budget just won't ... budge that far. This is closer than others I've seen (including most build-your-own), but still too far off unless you want to send me yours? But it is worth to buy even its pricey. Did you really see the features of it?? Have been wanting one of these for a long time!! A side question ... how many entries can I make into the Giveaway? Is there a limit (asside from points)? I've read through the rules and such and can't see any mention of numerous entries. Hmmm ... I used the share to G+ and facebook, but didn't see a share link for twitter. Would have done so there too, but now I've navigated away from the page. Go the rewards page, and click to enter the competition again, - it'll say you cant , but show you those buttons again. You can then use the twitter one. still no twitter link showing on the page ... I can email you a screenshot. something wrong in my account setup? am logged in using google auth. Figured out the problem ... was at work and they block twitter, so the twitter widget wasn't loading and so it seemed the twitter link wasn't there. Funny how they'd block twitter and not Facebook. anyway, thanks for the help. GIMME GIMME GIMME GIMME GIMME GIMME. Too beautiful <3 I want it so badly! looks great but completely useless for an average person, good luck everyone who took part! I've been tempted to buy one of these since they first came out, mainly to terrorise the people in our warehouse!